What is so special about this structure (or should we say ‘structures’)? It is in actual fact three separate buildings that are linked with each other via paths and decks. They all showcase a strong African style, but also tease us with different touches gathered from international designs, such as Turkish and Persian. And, of course, there is always that breathtaking landscape that surrounds this unique home. See what we mean when we say “linked up”? 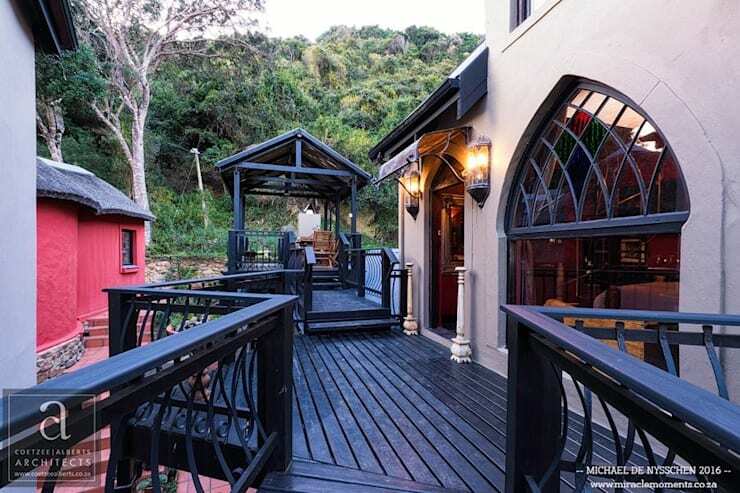 A wooden deck (adorned with dark and dramatic timber and wrought iron) ensures a flow between the different structures, as can be seen above. The rondavels with their thatched roofs (seen in the background on the left) flaunt a very strong African style, contrasting most wonderfully with the right-side façade that is decidedly more of a Turkish persuasion (just check out those curvy windows and exterior lighting fixtures). Bracing the interiors, we are treated to a delightful treat: an eclectic vision that showcases a bunch of different styles. Rugs, sofas, lights, and tables all contribute various styles (modern, rustic, classic) to the interior look, ensuring that there is something stylish and homely for just about everybody. 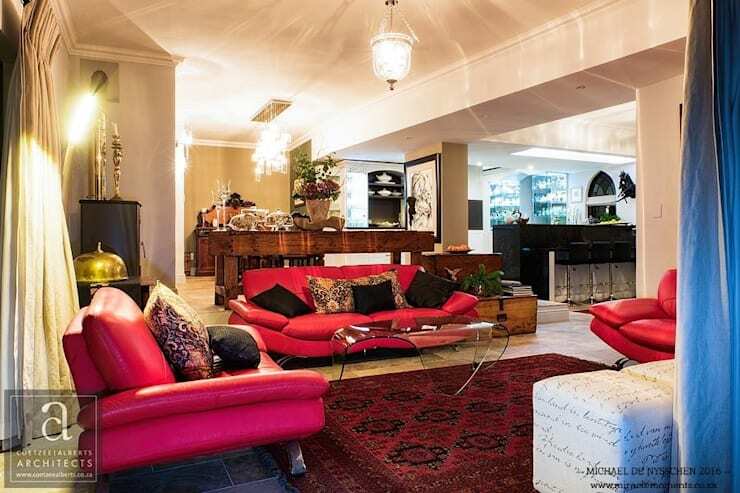 Don’t you love how that plush Persian rug offsets with the transparent and ultra contemporary coffee table? When it comes to the colour palette, we are in love with how it flaunts a rich decadence of warm tones, followed ever so closely by creamy neutrals. The modern style seems to dominate the culinary space of the house, where linear designs and neutral tones come together most stylishly. 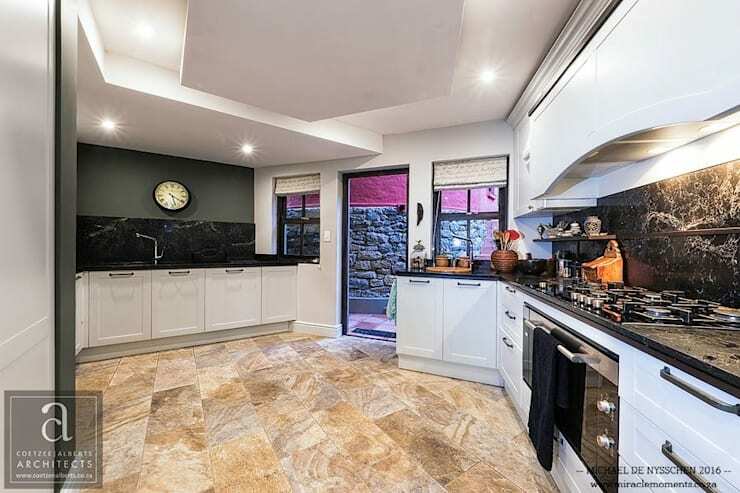 Thanks to its spacious layout, cooking and socialising can be enjoyed without a hitch in here (just look at all that counter space, ripe and ready for any whisking, cutting, boiling and stirring to take place). We locate the second living room, which is decidedly more formal than the first. First of all, this one is not part of an open plan, ensuring some added privacy. In addition, its colours aren’t as festive and lively as the other one, with golden browns and earthy hues ensuring more of a formal style and vibe. Our favourite piece in here? 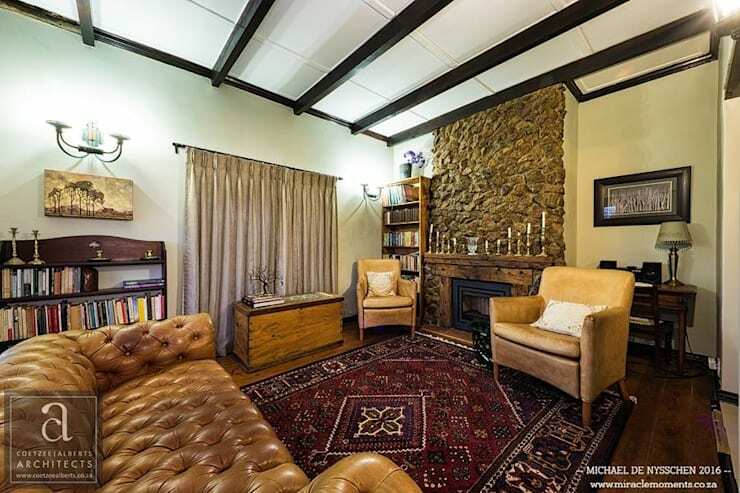 It is definitely a tie between that Chesterfield sofa and the stone-clad focal wall with the built-in fireplace. Part and parcel of the open-plan socialising area is a staircase – and a most modern one, we might add. 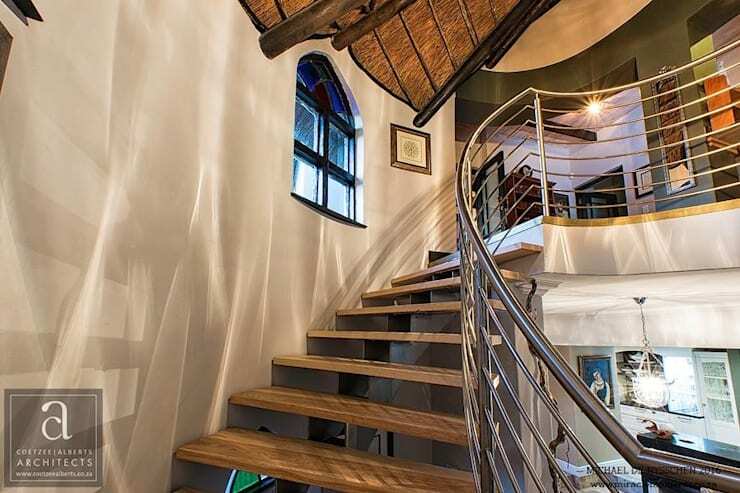 Stainless steel railings and wooden steps form a fabulous open-riser that transports us to the next floor, where the more private areas of the house awaits. 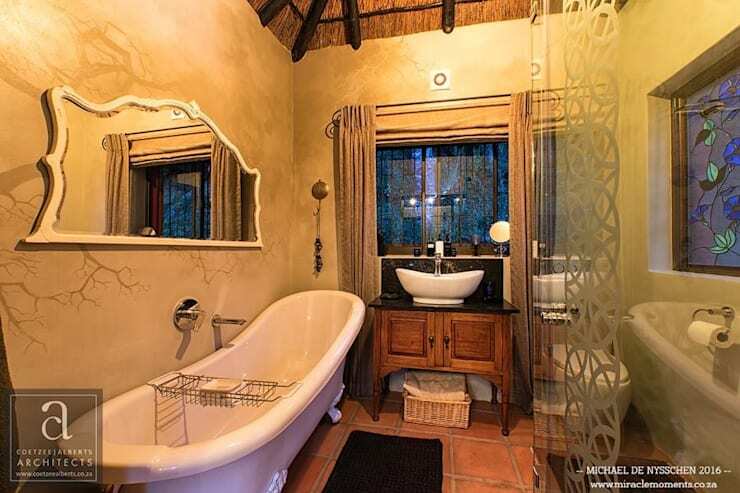 On to the bathroom, where the eclectic look once again comes out in full force: just see how that thatched ceiling balances with the modern pieces like the tub and wall mirror. The walls are nothing to be scoffed at either, with a delightful wall mural adorning the one side of the room, while a stained-glass window ensures an aesthetically pleasing vision on the other. 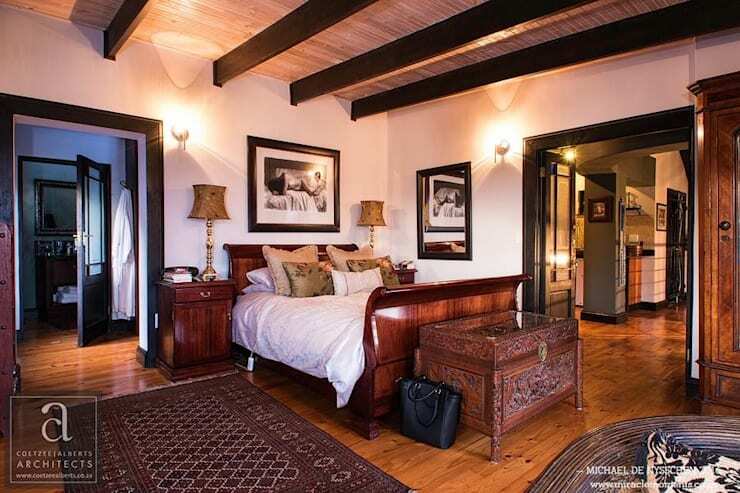 We close off our tour with a look at the master bedroom, which also flaunts a myriad of different styles: classic for the bed, oriental for the chest, and rustic ranch for the ceiling. As we’ve noticed thus far, wood is one of the prime design materials used in this creation, and here it again treats us to a fantastic vision via the polished wooden floor and the ceiling with its exposed beams. Falling behind on that beauty sleep? Then see our tips when it comes to: Bedroom Decor for Peaceful Sleep.